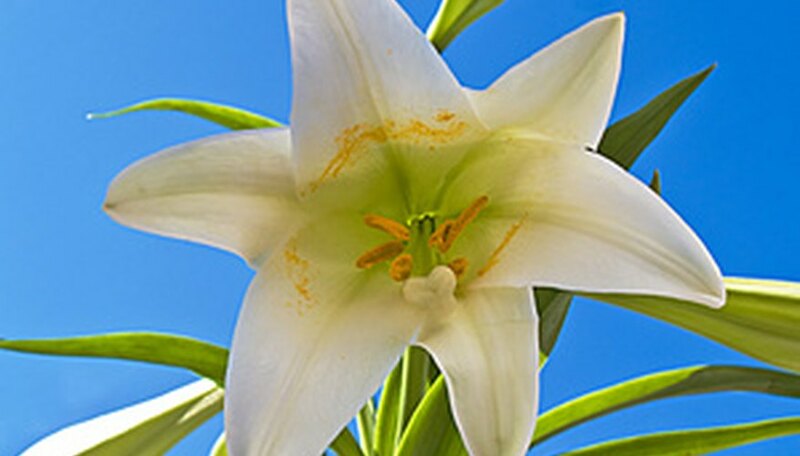 Easter lilies are grown from bulbs and can be grown in north and central Florida; however, they do not do well in south Florida. Most bulbs require a cool dormant period that south Florida rarely has. Growers force these bulbs to flower at Easter, making them a popular gift. When you plant the bulbs in your garden and grow them normally, they will flower in the summer. They are wonderful flowers to accent leafy shrubs or, when grown in groups, make a beautiful flower bed. Place a three-inch layer of compost around the shoot when it first starts coming out of the ground in January or February. Water the plant thoroughly to leach the compost into the ground. This will supply the bulb with nutrients to begin the growing season. Water the area to keep the bulb moist throughout the growing season. The soil should never be soggy, as this will promote bulb rot, but it should never be allowed to dry out either. How often you water will depend on soil type and weather. Most Florida soils are sandy and drain quickly, which means you will need to water more frequently. Apply a 12-4-8 or bulb-specific fertilizer once in the spring and again after flowering. If the soil is very sandy and you are watering every day, an extra dose of weak fertilizer may be needed in the early fall. This will help the bulb to store up nutrients for the next growing season. Spread a two-inch layer of mulch over the soil around the plants. The mulch should be organic so it adds nutrients to the soil as it decomposes. This will help to retain moisture and keep weeds from growing around the plants. Cut flowers off as they start to fade. Leave the foliage in place and keep it watered until it is yellowed or dead. The foliage will supply nutrients to the bulb for the next growing season.